School Health Services enhance academic achievement and student wellbeing through the provision of a comprehensive school health services program. School nurses function as a part of the school's multi-disciplinary team to bridge the gap between health, wellness, and learning. Program emphasis is directed toward prevention of disease and promotion of health, utilizing health services, health counseling, and health education. Many students are at risk for not succeeding in school because their chronic illness may interfere with attending school. School nurses support their attending school and help reduce interruptions to their learning. School nurses also identify and provide plans and treatments for students with special health needs. School Health Services, partner with parents/guardians, healthcare providers, and community resources to help students succeed in school. It is extremely important for you to check your child’s head on a regular basis. Visit the centers for disease control webpage for more information http://www.cdc.gov/parasites/lice/head/ . You can also contact your child’s school nurse with questions. Teach children not to share combs, brushes, hair ornaments, hats, caps, scarves, headsets, or any other personal headgear. Do not try on other people’s hats (even in department stores). Teach children to hang coats separately - placing hats and scarves inside coat/jacket sleeves. Clean or disinfect shared headgear (i.e., helmets) with Lysol® or rubbing alcohol before being used by others. To help avoid getting or spreading diseases such as Influenza and other illness, follow these simple tips from the Center for Disease Control (CDC). It's not to early to start planning for next year. Your child must have proof of one dose of Tdap and one dose of Meningococcal vaccine. 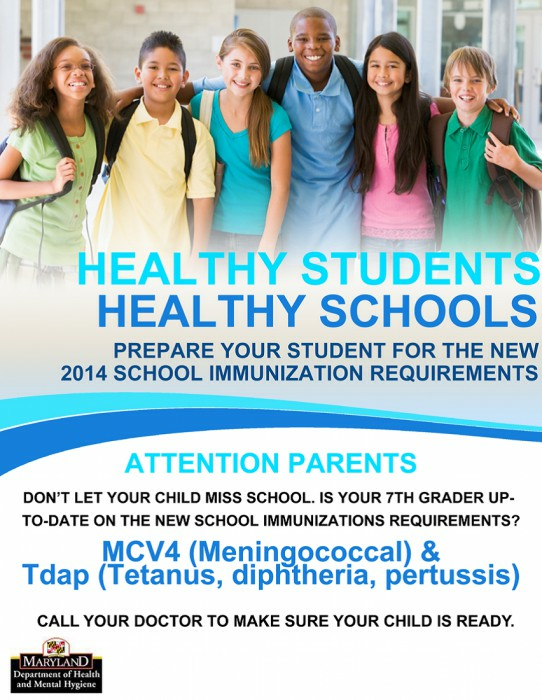 Please send documentation to the school nurse if your child has already received these immunizations. If not, it isn't too early to see your healthcare provider. School Nurse at Northern Middle School teaches a student about concussions. "Suicide: the Ripple Effect" movie will be shown May 7, 2019, in the Garrett College Auditorium from 4:45 PM - 7:00 PM. The school system wants to bring your attention to an internet social media "game" called the "Blue Whale Challenge".